While I was in San Antonio last month, on a segway tour (oh yes), I found out that there is a Del Sol store right in front of the Alamo. I decided that I couldn't leave without going in and getting my first color changing polishes from this lovely little company. They were have a sale at the time of 3 polishes for $25 (I believe was the deal), so I picked my three and received a cute Texas gift box set packaging. This is Sassy, which my boyfriend picked out. It starts out as a light pink and then is supposed to change to an orange color. 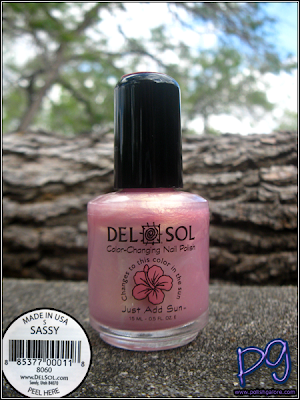 Del Sol is very careful to point out on their website that the colors you experience may very depending on the UV-Index of the sun, the number of coats you apply and the temperature. They do say they will replace the polish if it's not what you like. 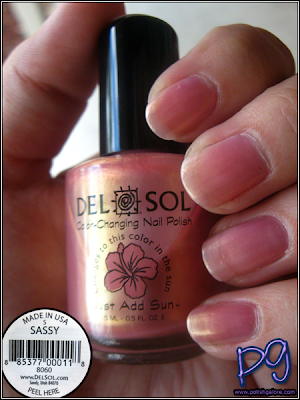 I chose a relatively warm day to check out this polish. I did not use a base or top coat and this is 4 layers of polish. First this is the color in the shade. You can see that even with 4 coats, you can still see my VNL on most nails. 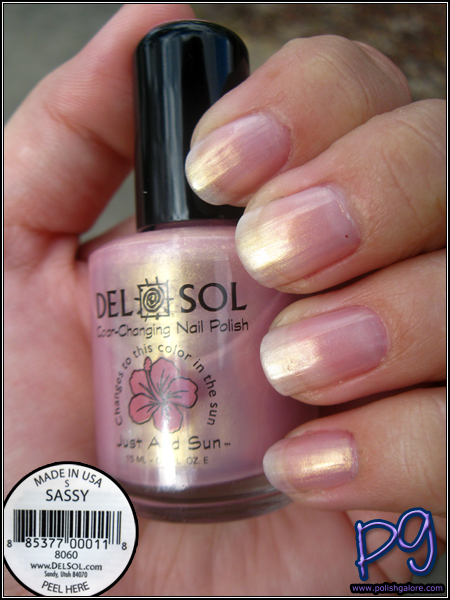 It's a light pink with a gold almost shimmer over the nail. Then I got in the sun and let the sun do its stuff. 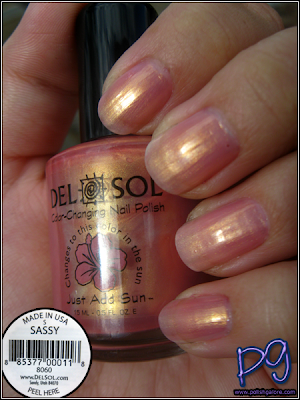 While my bottle did not go as orange as shown on Del Sol's website, there is a definitely difference in the color. I also grabbed one last picture in the shade before the color cooled down. It's definitely a nice novelty item! Del Sol may be ordered online for $10 a bottle with free shipping on orders over $50. You can also find stores with their Store Locator. For social media, Del Sol has a Twitter, a YouTube channel, a Google+ page and a Facebook page. Oo, that's actually a pretty shade! I saw the photo of the bottle and thought 'eh' but then the swatches looked to gorgeous! I love it!